Did you ever wonder how many coins come in a roll? For example, do you know how many coins are in a roll of nickels? What about dimes? Or dollar coins? Every denomination of coin roll contains a certain number of coins. Why Do We Use Coin Rolls Anyway? Coin rolls are stacked bundles of coins worth a certain amount of money in face value. They’re used to help organize large amounts of loose change and are the preferred method for banks and merchants to receive and dispense big quantities of coins. Coin rolls are also favored by coin collectors who enjoy searching through circulated coins to look for old coins, rare coins, error coins, and other types of interesting and unusual coinage. I enjoy looking through rolls of coins because it’s generally easier to find old and rare coins when looking through rolls of coins rather than picking through individual coins that come and go through my hands as pocket change. I also like to roll coins up in wrappers when depositing in my bank the change from my coin jar — it’s easier to deposit them this way at the bank. Whether I look at them through the eyes of a numismatist or as a typical coin-spending American, coin rolls are an important part of commerce and are essential to helping the exchange of physical currency in commerce. Here are the most valuable coins you should be saving in all denominations. Numismatists can’t determine exactly when the first coin rolls emerged. Some theories suggest coin rolls in simple paper wrappers may have first been employed by banks hundreds of years ago. Possible evidence for early coin rolls can even be found in old shipwrecks containing coins. In many cases, shipwreck coins are found in small stacks — suggesting they were originally rolled in paper wrappers before the paper disintegrated underwater. Automated coin wrapping mechanisms came into widespread use during the early 20th century, with the most popular of these being the Batdorf coin package wrapper — which was granted a patent in September 1913. With the rise of automated coin wrappers, coin rolls became much more common. Original Bank Wrapped roll coins (also called OBW coins) are those that are still in their original bank rolls. 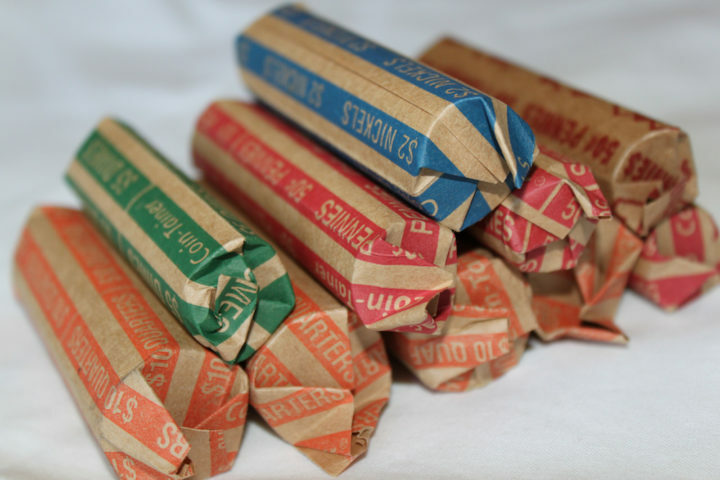 OBW coin rolls from the first half of the 20th century on which the bank name is visible are often worth more money than OBW coins in plain wrappers. 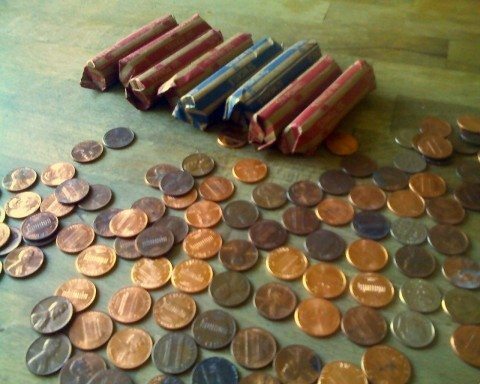 What’s The Easiest Way To Roll Coins? 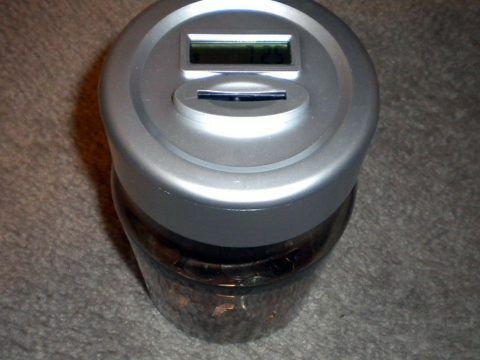 Have a bunch of coins sitting around in your change jar that you need to wrap? But what if you’ve got thousands of coins and don’t really want to spend time looking at every coin? There are several great coin counters and coin wrapping machines available that can count and wrap your coins, lickety-split! Ever go on eBay and see a roll of old coins that has what appears to be a key date coin on the end? You know, a roll of old pennies with the reverse of a VDB penny (maybe a 1909-S VDB penny) appearing at the end of the roll? Perhaps even more tempting for coin buyers are those penny rolls that have something like a 1916 Mercury dime (possibly a rare 1916-D Mercury dime) that somehow winds up at the end of the roll. It’s possible to buy a coin roll crimping machine for less than $500 — which means anyone can make a crimped roll of coins – not just the bank! How do you know a roll of coins is really unsearched? You don’t. Shotgun rolls and unsearched rolls offer no guarantees. How come the dime always seems to wind up at the end of the penny roll listed on eBay? The chances of this happening with an automated coin-rolling machine by accident are extremely slim. So why do so many of these rolls seem to exist? And how is it that a coin that offers tempting hints that it could be a rarity always appear to pop up at the end of the roll and not in the middle? These are almost always plants to entice people to buy the coin rolls and see what’s on the inside. In most cases, the rolls aren’t worth as much as the inflated buy price. If you’re a coin collector who enjoys looking through rolls for old coins, rare coins, error coins, and other interesting pieces, then coin roll searching is for you! I’ve found many old, rare, and valuable coins in rolls! Here’s a summary of my experiences with coin roll hunting, plus a list of coins you should be looking for in bank rolls. 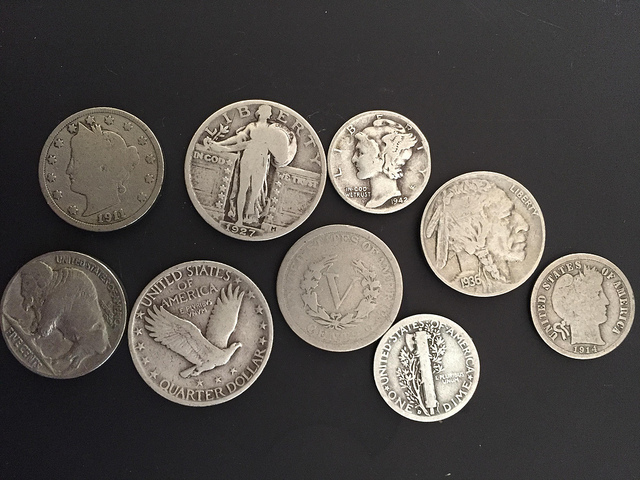 Finding old and rare coins — such as Indian Head pennies or 90% silver dimes — may be possible while searching through old coin rolls, but it isn’t necessarily easy to make those discoveries. Ask bank tellers if they have recently seen older-looking rolls of coins come into the bank. If so, buy any they may have on hand. Half dollars and penny rolls tend to yield the highest number of “keepers” per roll. I’ve found a wheat cent at least once every 2 or 3 penny rolls I’ve searched, and 40% or 90% silver Kennedy half dollars tend to appear in every 1 or 2 rolls, too. Errors and varieties can be hard to spot at first. My advice is to hold aside all coins from a certain date that are widely known for their errors — such as 1972 cents (there was a doubled die made that year) or 1982 Kennedy half dollars (missing Frank Gasparro’s FG initials to the right of the eagle’s tail) — and look for the presence of errors on those coins when you have more time.